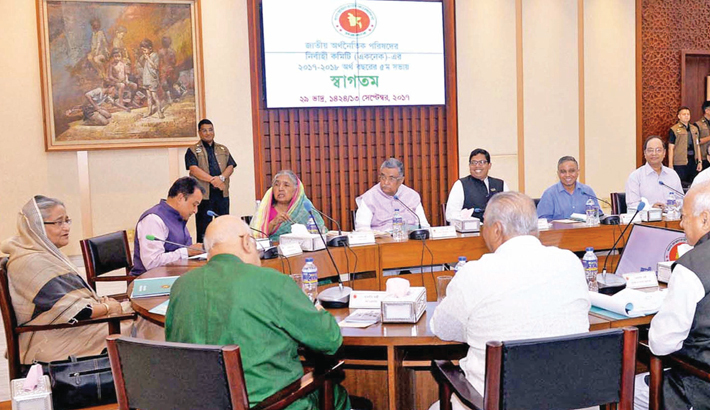 Prime Minister Sheikh Hasina presides over a meeting of the Executive Committee of National Economic Council (Ecnec) at NEC conference room at Sher-e-Bangla Nagar in the capital on Wednesday. A Tk 6.65 billion (665 crore) project for lawmakers got nod on Wednesday in a bid to improve some 10,000 social universal infrastructures like graveyards, mosques, crematories, temples and churches across the country. The approval came at the meeting of Executive Committee of the National Economic Council (Ecnec) with Prime Minister Sheikh Hasina in the chair. Under the ‘Universal Social Infrastructure Development Project’ the social infrastructures in electoral constituencies will be developed, renovated and extended according to lawmakers’ preferences. “Lawmakers won’t get the allocations directly as the project will be implemented through Local Gvoernment Engineering Department (LGED),” said Planning Minister AHM Mustafa Kamal at a press briefing after the Ecnec meeting. “But the work has to be done upon preferences of the lawmakers,” he added. It has been proposed in the project to allocate one crore taka each to 491 upazilas excluding city corporations, said the minister adding that LGED will implement the project by June 2020. The list of these 10,000 social and religious infrastructures have been prepared following the recommendations of the members of parliament (MPs) and based on the need of the concerned public representatives, representatives of the institutions and local people alongside actual status of these infrastructures. Under the project, Tk 109 crore will be provided as block allocations to provide more than taka one core if there is more requirement. The planning minister informed that the Ecnec meeting approved a total of 10 projects with a total estimated cost of Tk 51.80 billion (5,180.73 crore). Of the cost, Tk 44.62 billion (4,462.25 crore) will come from the state coffer, Tk 19.93 crore from the organisation's own fund while the rest of Tk 6.98 billion (698.57 crore) from project assistance. Approval also came for ‘Important Rural infrastructures development of Sylhet Division project of Tk 12.14 billion (1,214.35 crore) and ‘Important Rural infrastructures development of greater Comilla (3rd phase) project with of Tk 9.86 billion (986 crore). LGED is expected to complete both the projects by June 2022. The project for Sylhet Division will cover 39 upazilas of Sylhet, Moulvibazar, Habiganj and Sunamganj districts, while the project in greater Comilla will cover 34 upazilas of Comilla, Brahmanbaria and Chandpur districts. Under these two projects, roads, bridges, culverts and haat-bazars in upazilas, unions and villages will be constructed and improved alongside afforestation. The Ecnec also approved ‘construction of multistoried integrated government office building in Gopalganj project’ of Tk 97.94 crore. While approving the project, Prime Minister Sheikh Hasina suggested accommodating all government offices in a single building in each district to render services to the common people from one building, informed Kamal. The other approved projects are: Rehabilitation through slope protection work from the erosion-prone 72nd polder under Sandwip upazila in Chittagong of Tk 1.97 bilion (197.04cr), water supply and sanitation project at 23 pourashavas in Bangladesh of Tk 9.91 billion (991.74cr), Construction of cleaners residential building at Narayanganj city corporation of Tk 996.6 million (99.66cr). And construction of 103.43 meter-long PC girder Bridge on Aricha (Borangail)-Gheor-Daulatpur-Tangail road of Tk 65.15cr, Establishment of computer and language training lab (2nd revised) at the educational institutions across the country, of Tk 397.78cr, and Protection of Khudbandi, Singrabari and Shuvgachha areas of Kazipur Upazila under Sirajganj district from Jamuna bank erosion project of Tk 465cr.